So, I guess I should let you all know…. Wow. Yeah. So, that happened. I’m also happy to announce that I have accepted an excellent fellowship position at an extremely high-powered institution. I will be specializing in Palliative Care, which is a relatively new branch of medicine that focuses on pain control, non-pain symptom control, counseling for difficult medical decisions, end-of-life care, bioethics, and minimization of the trauma of hospitalization and critical/terminal illness. This will all start next year. What am I going to do with my year? Well, I’m glad you asked. I’m going to study for the boards, write a book, take a few classes toward an MBA, and help run a Phase I trial for a potential new treatment for sickle cell disease. And if I’m alive, I’ll be moving to a new city around this time next year. What will I not be doing? 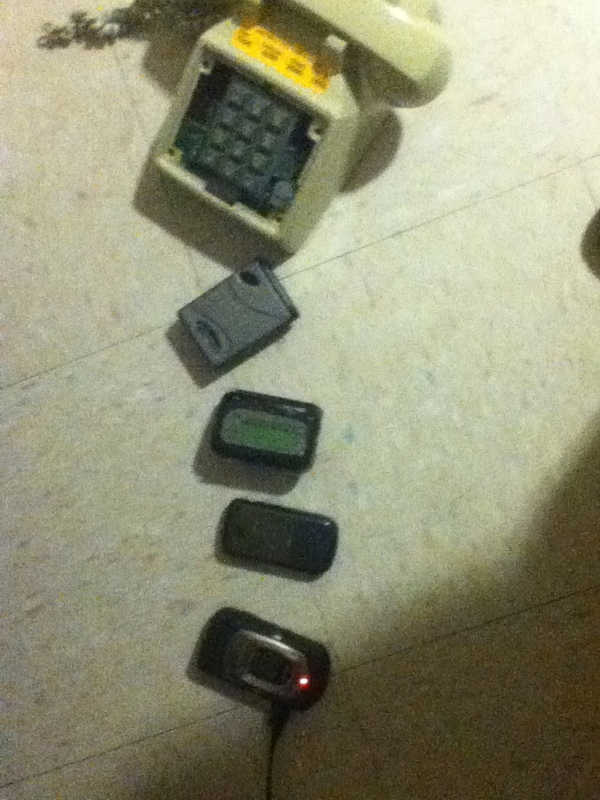 From top to bottom: The call room’s phone, the code pager, my personal pager, my personal cell phone (don’t judge), and the ER direct-line cell phone. Picture taken by my iPhone, which was also capable of waking me up. Oh yeah, and maybe I’ll write an article or two for you guys. Because you were so patient while I finished up my Resident Evil….I mean Evil Residency.